The ink of cephalopods such as squid and cuttlefish have historically been used in a number of ways, but more recently the primary use has been in cooking. Popular in Spanish cuisine, in addition to lending a dramatic quality to pasta and risotto dishes, the jet black ink also brings a unique flavour quality to the dishes it colours. Squid ink can be purchased in sachets online and from fishmongers, but if you are feeling adventurous you could try extracting the ink yourself. For an imaginatively presented starter, try Luke Holder’s crab with garganelli recipe, which is served in a crab’s head. 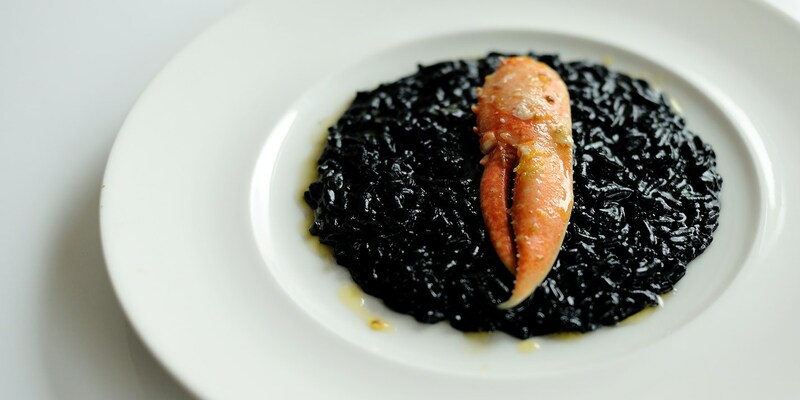 For an easy main, Andrew MacKenzie’s squid ink risotto, garnished with a lobster claw, has real impact, as does Colin McGurran’s impressive baked bream with nero sauce. For a meatier main option, Steven Smith’s chicken, asparagus and mushroom recipe utilises the dramatic qualities of squid ink for a stunning charred leek purée.